You do not have to be a member of CEC and CASE to get the CASE weekly update. But, you do have to be a member to receive the CASE quarterly newsletter, IN CASE and you do have to be a member to receive a free copy of the CASE Lucky 21 books when they first come out. All the other regular features and of course news/pictures from the CASE activities at the April CEC Convention in San Antonio! But, you have to be a member to get this 24 page newsletter, full of useful information. To join CASE/CEC click here. The sixth monograph of the CASE Lucky 21 series is out and ready to mail to CASE members. As you who have been CASE members for the last few years know, each time CASE does a new monograph, every CASE member receives a free copy. The next one is scheduled to be mailed out on May 16 but depending on where you live the arrival date will vary. 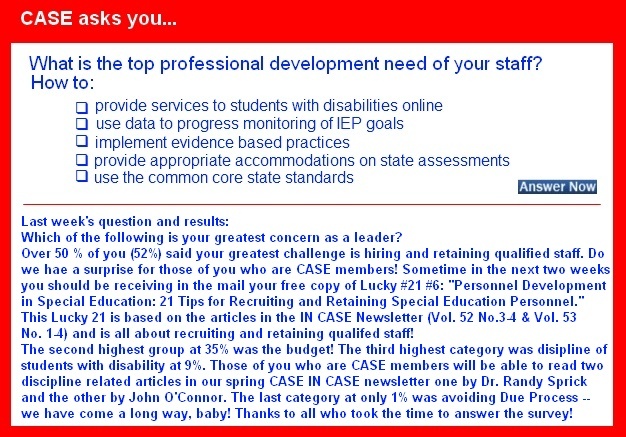 The title of Lucky 21 #6 is "Personnel Development in Special Education: 21 Tips for Recruiting and Retaining Special Education Personnel." This monograph is especially timely based on the results of last week's poll — those of you who took the poll indicated your number one concern is hiring and retaining qualified staff. The monograph is the reprinting of articles from the IN CASE newsletter (Vol. 52 No. 3-4 - Vol. 53 No. 1-4 ). We anticipate this monograph to be very helpful and practical to have around and CASE members are receiving it free. Others can purchase copies after May 16 on the CASE website in the Resources section. Don't forget another CASE member benefit is to receive discounts on registrations for the CASE Professional Development opportunities. Have you registered for the 11th Annual CASE Educational Legislative Leadership Summit? If not, click here for additional information and register today! So, CASE membership is definitely a membership with benefits. Hope you have a great week! May 6-10 marks Exceptional Children's Week, Teacher Appreciation Week and Children's Mental Health Week. Whew — that's a lot to celebrate in one week. Luckily, at CEC — while we love the public attention — we are appreciative every day. Newsweek released its top 100 high schools across the country. Topping this list — for the second year in a row — is the Gatton Academy of Mathematics and Science in Kentucky, a public high school located on the campus of Western Kentucky University and led by CEC member, Dr. Julia Link Roberts. The House Education and the Workforce Committee convened a hearing to discuss the appropriate role of the federal government in the educational accountability system, as it prepares for the reauthorization — rewrite — of the Elementary and Secondary Education Act/No Child Left Behind. Significantly more children have disabilities today as compared to a decade ago, largely due to increased diagnosis of neurodevelopmental and mental health conditions, researchers say. We have to be able to talk about this. No, not in a way that pits families of special-needs students against the families of other students, and certainly not in a way that would even suggest children with mental and physical disabilities don't deserve and aren't entitled to the same educational opportunities as any other students. Kids that have both attention deficit hyperactivity disorder and a lower IQ may not differ so much from kids with ADHD and a normal IQ. It appears that ADHD may affect kids with different IQ scores very similarly. A recent study looked at the characteristics of ADHD in kids with normal intellect and kids with mild intellectual disability. The results showed that symptoms and subtypes of ADHD and secondary disorders were very similar in both groups. Living rooms, dens, kitchens, even bedrooms: Investigators followed students into the spaces where homework gets done. Pens poised over their "study observation forms," the observers watched intently as the students — in middle school, high school and college, 263 in all — opened their books and turned on their computers. Significantly more children have disabilities today as compared to a decade ago, largely due to increased diagnosis of neurodevelopmental and mental health conditions, researchers say. The prevalence of disability in children grew more than 16 percent in 10 years, according to findings presented Sunday at the Pediatric Academic Societies annual meeting, a gathering of four leading pediatric organizations held in Washington, D.C. Looking for similar articles? Search here, keyword DISABILITIES. Senate Bill 33, also known as the "Dyslexia Bill" was signed by Gov. Mike Beebe on April 16. And to celebrate, dozens of people released balloons on the steps of the capitol. Dyslexia is a language processing disability that affects at least one in every five children in the United States, but with the enactment of Senate Bill 33, those children will get the resources and support they need from the public school system to be successful students. Competency-based learning, which allows students to progress at their own pace after they've shown mastery of a subject, rather than by their age, is quickly gaining momentum. Already, a few states like New Hampshire, Maine and Oregon are moving towards implementing competency-based learning models throughout the entire state. What's more, 40 states have at least district experimenting with the model. But despite this growth, its proponents say federal policies for accountability and assessment are holding the movement back. The Wisconsin Department of Public Instruction must take much stronger steps to ensure children with disabilities are enrolled and served properly by private voucher schools, according to a just-released letter from the U.S. Department of Justice that emboldened disability rights advocates. The directives from the Department of Justice's Civil Rights Division seemed to bolster allegations that some private schools in the Milwaukee Parental Choice Program denied enrollment to some children with special needs or forced them out of the school as a result of their disability — or behavior stemming from it. Widespread technical failures and interruptions of recent online testing in a number of states have shaken the confidence of educators and policymakers in high-tech assessment methods and raised serious concerns about schools' technological readiness for the coming Common Core online tests. The glitches arose as many districts in the 46 states that have signed on to the Common Core State Standards are trying to ramp up their technological infrastructure to prepare for the requirement that students take online assessments starting in 2014-2015. More than 90 percent of pediatric specialists who diagnose and manage attention-deficit/hyperactivity disorder in preschoolers do not follow the American Academy of Pediatrics clinical-treatment guidelines. That's the conclusion of researchers from the Cohen Children's Medical Center of New York, which sent the Preschool ADHD Treatment Questionnaire to a random sample of 3,000 physicians who specialize in diagnosing and treating neurobehavioral conditions nationwide. One of the chief complaints about the No Child Left Behind Act has been that districts and schools that fail to meet achievement targets face serious sanctions, while schools that do a good job of closing the gaps between traditionally overlooked groups of students and their peers essentially get little in return. To help alleviate those concerns, the U.S. Department of Education asked states to identify so-called "reward schools" in their applications for waivers easing demands of the NCLB law, the current version of the Elementary and Secondary Education Act, which Congress has yet to revise. Your child's brain on math: Don't bother? Parents whose children are struggling with math often view intense tutoring as the best way to help them master crucial skills, but a new study released suggests that for some kids even that is a lost cause. According to the research, the size of one key brain structure and the connections between it and other regions can help identify the 8- and 9-year-olds who will hardly benefit from one-on-one math instruction. Mental health services for children are frequently provided by schools, especially when families are unable or unwilling to engage with often limited resources in their own communities. Therefore, if educators do not address the social-emotional health of their students, the difficulties will likely continue or increase, and school success and even completion may be jeopardized. Most public school teachers feel unprepared to teach math and reading to the Common Core standards that are rolling out in 45 states and the District, according to a poll of 800 teachers released by the American Federation of Teachers. The new standards, written by a group of states and embraced by the Obama administration, set common goals for reading, writing and math skills that students should develop from kindergarten through high school graduation. Curriculum is left to the states. The standards emphasize critical thinking and problem solving and are supposed to encourage students to think deeply about fewer topics. Writing is an important part of the Common Core State Standards in English language arts, but what about students learning to employ the digital tools so natural to them outside the classroom to express themselves in school? The challenges to "going digital" with writing instruction range from choosing the best methods to employ the latest technological tools to accessing quality in-service and joining communities of practice to staying current with the changing definition of a "literate" citizenry.